Jessica Harrison has a deep respect for the traditional art of porcelain. One look at the artist's portfolio, and it's not difficult to notice a particular penchant for ceramic; albeit, a macabre one. 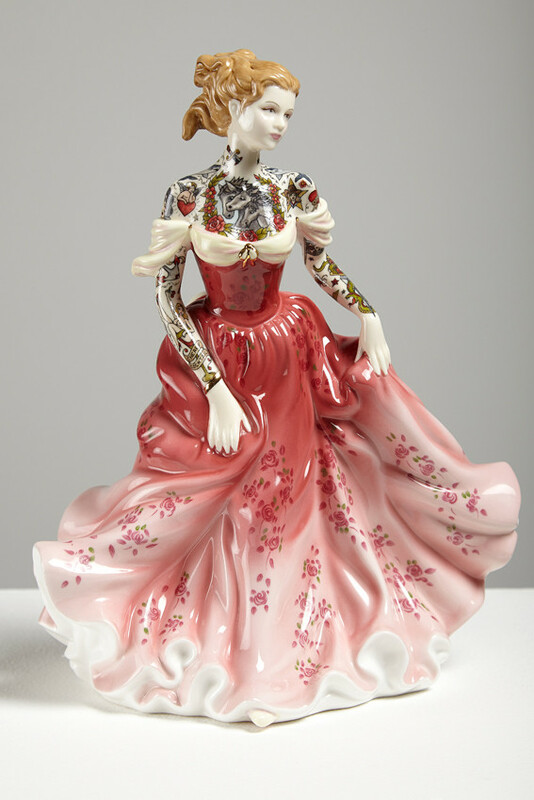 For one of her series, she transformed delicate porcelain dolls into mutilated zombie figurines, the female form's intricate dresses and graceful limbs doused with blood and hacked at the joints. Harrison turns the taboos of femininity on their heads, proving what's on the outside -- be it bodices, braids or pink cheeks -- does not always match what's in the inside -- in the case of "Broken," literal guts. Challenging assumptions associated with the body doesn't stop there, of course. 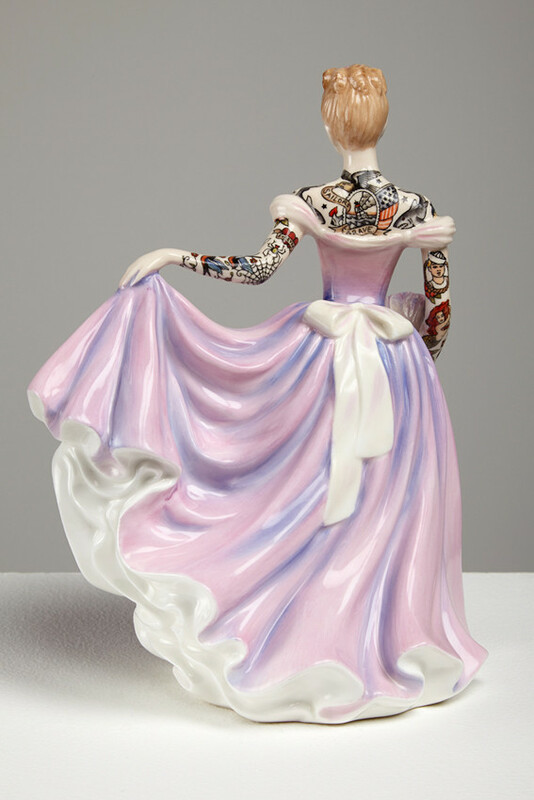 In a new sculptural project, Harrison has adorned the pristine skin of porcelain dolls with permanent decorations historically reserved for hardened sailors. Her figurines receive the tattoo treatment, once again turning the female form into a canvas on which she explores the binaries of the body. "Harrison proposes a multi-directional and pervasive model of skin as a space in which body and world mingle," proclaims Harrison's artist statement. "Working with this moving space between artist/maker and viewer, she draws on the active body in both making and interpreting sculpture to unravel imaginative touch and proprioceptive sensation in sculptural practice." 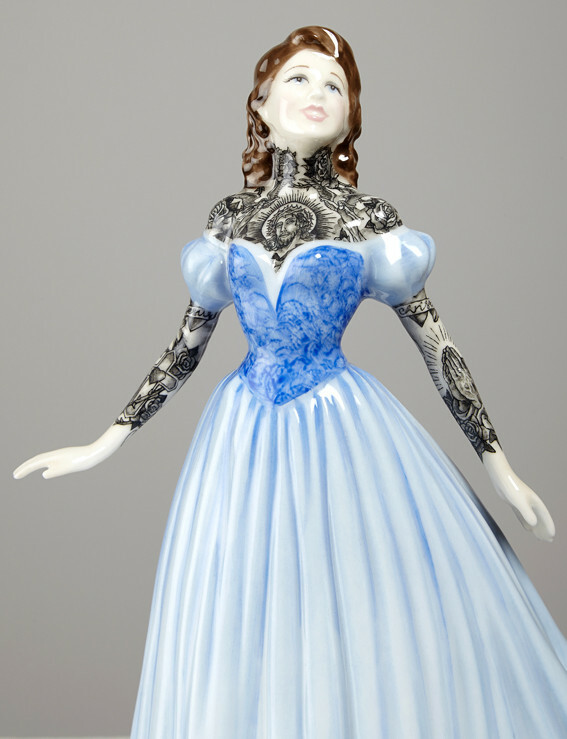 Her tattooed creations are making their debut at Galerie L.J. in Paris. Titled "Flash," the works draw inspiration from French philosopher Michel Serres, who muses about the relationship between the soul and our sense of touch. "I touch one lip with my middle finger. Consciousness dwells in this contact," he wrote in Les Cinq Sens (The Five Senses). "Often consciousness conceals itself in folds... when the skin tissue folds upon itself. By itself, the skin takes on consciousness... Without this folding-over, this contact of the self with itself, there would be no internal sense, no body of one's own." For Harrison, this consciousness oozes to the surface for all to see, taking the shape of inked roses and ships and skulls. In stark contrast to the flowing ball gowns and neatly pinned hair, her women possess darkly ornate bodies that prompt the viewer to question what lies beneath. "Her research considers the relationship between interior and exterior spaces of the body, but looks neither inwards towards a hidden core, nor outwards from the subconscious," her statement explains, "instead looking orthogonally across the skin to the movement of the body itself, using the surface of the body as a mode of both looking and thinking." Based in Edinburgh, Scotland, Harrison pursued a PhD in sculpture in 2013, funded by the Arts and Humanities Research Council. Intrigued by the "tactility" of the medium, she infused her 3D objects with a sense of mortality and being we typically associate with humans, not dolls. Scroll through a preview of "Flash" below and let us know your thoughts on the works in the comments. "Flash" will be on view at Galerie L.J. until June 24, 2014.